This application provides details on recent earthquakes across New Zealand. It will also provide the description of the events as well as plot the events based on the latitude and longitude within 2 decimal places (this may differ from the event mapped by Geonet as they use more decimal places for the latitude and longitude for an event). 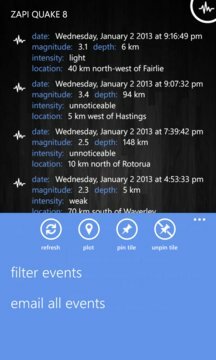 There is support for a live tile that can be added to your start screen and with the help of a background agent, this tile can be updated every 30 minutes or so with the latest earthquake events. 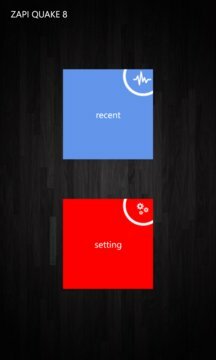 There is also support for lock screen mode which means that you will be notified about the latest earthquake events even though your phone is under lock screen mode. You can set the default magnitude to filter all earthquake events so that you can see what you prefer. You can plot all 30 recent earthquake events on a map or view each individual one. You can share earthquake events via email, sms or even your social networks. Using the new map features you can view the earthquake events in 3D, switch between dark and light mode for the map, turn landmarks on or off and turn pedestrian features on or off.